A medium even-8ths song with a long form, based on a rhythmic call-and-response vamp. First recorded by Rahn in a duo setting with young bass phenom Daryl Johns. 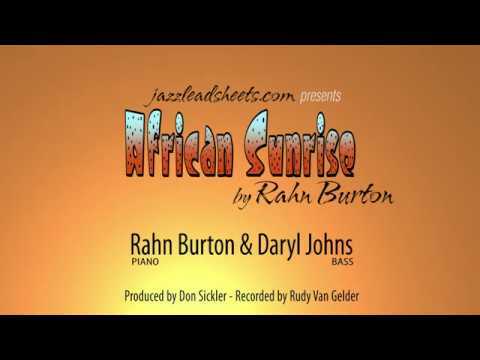 Young Daryl Johns joins Rahn Burton in a piano/bass duo interpretation of Rahn's AFRICAN SUNRISE. August 25, 2011 at the Van Gelder Recording Studio. This mesmerizing song is based on a rhythmic vamp that serves as an intro and coda, but does not appear in the song's form. It's a four-measure figure that alternates two measures of rhythmic bass line, under one long chord, with two measures of moving chords, in a similar rhythm, over one long bass note. The head is an extended AABC form with 16-measure A sections and a 24-measure bridge. The laid-back, bossa-like melody connects the changes, which in the A section weave from D minor through descending key centers before landing in D♭ major. The bridge has subtle pedal points, first on E♭ and then on D. On this recording, Rahn plays the intro figure twice after the out head, and then solos over the same vamp before coming in with the same figure two more times. The C treble clef and C bass clef lead sheets have the bass line written out for the intro; B♭ andE♭ lead sheets show cues for the bass line. When jazzleadsheets.com's Don Sickler was researching the music of Rahsaan Roland Kirk, he wanted to confirm some musical details with people who played with Rahsaan. One musician he found, who luckily lived in New York City, was pianist Rahn Burton. Rahn was happy to go over Don's questions, as he'd played with Rahsaan for many years. As they were talking at our studio, Rahn mentioned that he had some compositions of his own, even a few that had never been recorded. He was glad to bring them over, and Don found a few that he thought would be ideal for another project, piano/bass duos with young bassist Daryl Johns. As you can see from the video of the recording session, the duo "clicked."